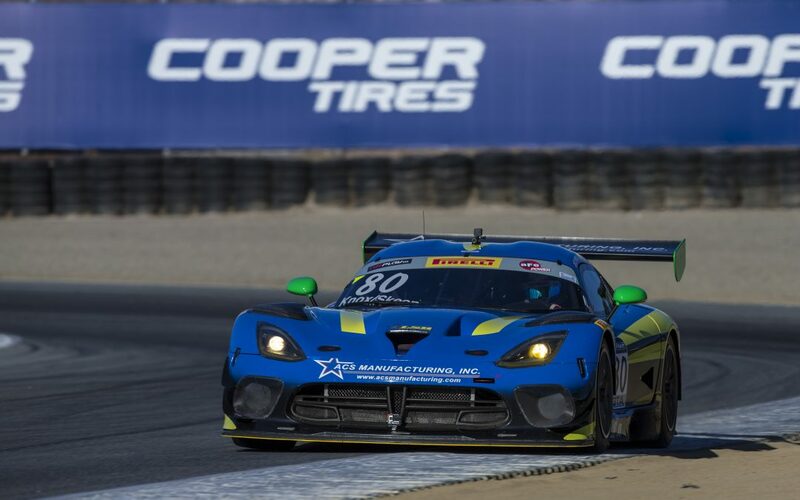 MONTEREY, California (October 6, 2016) – Dan Knox, Mike Skeen and Lone Star Racing will race the team’s No.80 ACS Manufacturing/Lone Star Racing Dodge Viper GT3-R in the season-ending Pirelli World Challenge race weekend at Mazda Raceway Laguna Seca, October 7 – 9. Knox and Lone Star Racing made the decision to add the Pirelli World Challenge closer to the team’s 2016 calendar after completing a planned four-race schedule in the No. 80 Viper in the GT Daytona (GTD) class of the IMSA WeatherTech SportsCar Championship. Hitting its stride as a team with a season-high eighth-place finish in their last GTD appearance of the year at Circuit of The Americas (COTA), Knox and Lone Star Racing Team Manager AJ Petersen turned to the World Challenge finale as a way to continue their 2016 racing program. Knox and Skeen will co-drive the No. 80 in the weekend’s Pirelli World Challenge SprintX doubleheader. Lone Star’s four-race GTD schedule began during the IMSA race weekend at Laguna Seca this past May. Lone Star’s decision to extend its season with another race on the legendary Laguna Seca circuit was an easy one. In addition to COTA and both Laguna Seca races, Lone Star’s 2016 race calendar also included Road America and VIRginia International Raceway (VIR). The Pirelli World Challenge season finale begins Friday, October 7, with live online coverage at http://world-challenge.com/streamvideo/ and http://livetiming.net/pwc/. The weekend’s Saturday and Sunday races can be followed through the same video and live-timing channels. About Lone Star Racing: Based at Motorsport Ranch within the greater Dallas-Fort Worth area in Cresson, Texas, Lone Star Racing is in its third season campaigning the No. 80 ACS Manufacturing Dodge Viper GT3-R. The team is running a four-race IMSA GT Daytona (GTD) program in 2016 after debuting in the class with a seventh-place finish last year at Circuit of The Americas (COTA). Although Lone Star Racing is new to IMSA, its team members have won races across North America spanning sprint and endurance racing formats. The crew has worked together on many different teams and various types of cars, developing a strong bond and proven capability that gives them a competitive and winning advantage. The team races with the support of primary partner ACS Manufacturing, Inc. (www.acsmanufacturing.com). Look for Lone Star Racing and Dan Knox on Facebook and follow the team on Twitter @LSRTeam.